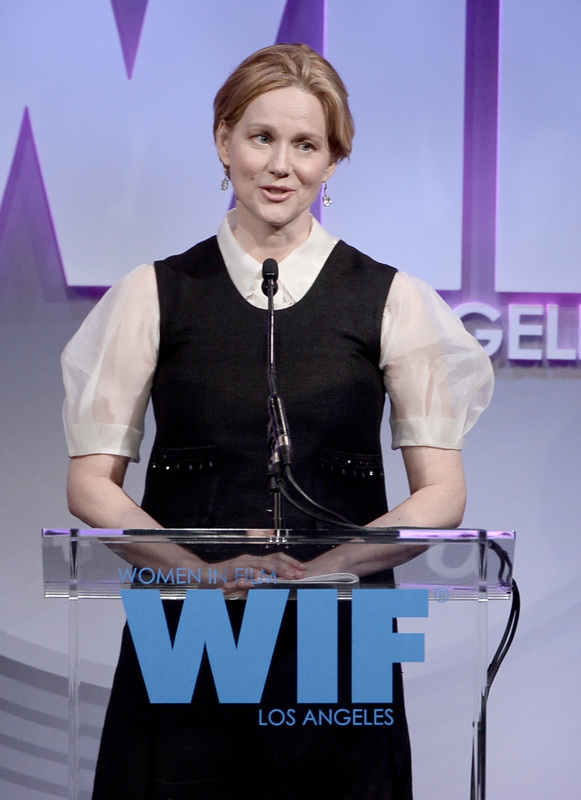 After receiving the Crystal Award for Excellence in Film by Women in Film, Laura Linney took the podium to accept her honor, and to give a totally boss speech about the state of women in film. Let me rephrase: She took the stage to give a totally boss speech about the disdainful state of women in film. Though Hollywood's status as a boy's club has been well-established for years — and the lack of women behind-the-scenes been heavily chronicled — Linney proved that even a three-time Oscar nominee with experience in films both commercial (Love Actually) and critically acclaimed (The Savages) still struggles with fitting in as a minority in her industry. Below, see the four most striking quotes from her speech, and immediately go back to wishing she and Karl could have just worked it out. "An enormous amount of time and energy went into conversations about the color of my hair. Producers, all male, would shake their heads in dismay, and send me back to the colorist with some idea of what they wanted with their very specific and helpful straight man vocabulary of “MORE” blonde or “LESS” blonde. ( I always thought they were trying to re-create a color from some old flame). It became absurd and predicable and a complete waste of time…..I have been more shades of blonde then you can possibly imagine. And it is a miracle that I have a strand left in my head." "As an actress in film, it is very easy to become isolated just due to the ratio of gender inequality that exists. Rarely do you have a scene with other women, very few women are on the crew, and what few female executives arrive tend to keep to themselves. You have fewer and fewer women to turn to for help or advice, and information is not easily shared." "I believe has something to do with the slow pace of progress women are making, not only in their artistic lives, but especially in their business lives. The news about inequality in pay between men and women, whether in film or television, seems to be worse than it was twenty years ago. And while we are all aware of the upheavals and drama in the world of finance, the numbers and the disparity is simply too extreme to justify any excuse." "Talk about money, talk about fear, talk about balancing family and work. Talk about aging: what is liberating about it, and what is brutal. Talk to each other and get honest. Teach and guide."